I’ve been doing some migration work for the last few weeks and found an interesting behaviour of vMotion that I would like to share with you. The migration work was quite simple, just had to vMotion a few virtual machines from a cluster to another due to SQL licensing. The end-users wanted the migration to happen live but they were OK with a few packets loss. As there were shared storage available, it’s been decided to use vMotion + storage vMotion. All 8 ESXi servers in source and destination clusters were with active/active on the physical interfaces, i.e. No LAG. What I thought was that when a virtual machine was being migrated from ESXi_Source_Migration to ESXi_Destination_Migration, it should have been using vMotion VMKernel in 10.10.21.x subnet so that it can talk to the destination. 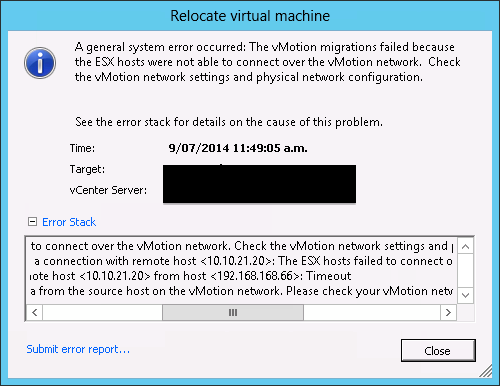 The quick fix was to remove 192.168.168.x vMotion VMKernel from the source ESXi server and it worked. 10.10.21.x VMKernel was being used, not 192.168.168.x. Here again, 10.10.21.x VMKernel was removed which allowed the vMotion to be accomplished. With the result above, it’s could be concluded that vMotion uses only one vMotion VMKernel and the latest one that was active before. Since removing/adding vMotion VMKernels wasn’t an ideal process, it’s been decided to change the destination vMotion VMKernels in 192.168.168.x subnet. After modification, inter/intra cluster vMotion worked fine. 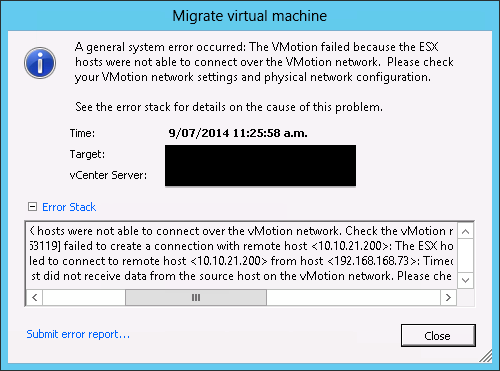 Even though it’s possible to add multiple vMotion VMKernels, apparently it’s not supported in this situation. Probably this is something VMware could improve in future to support this. For now, using the vMotion VMKernels in the same subnet would be the best & easiest option.